Samantha's Bookshelf: My Travels Part Two! Hello hello, this post is picking up from Part One. This is the part where I travelled from Victoria Falls up to Nairobi! A day later we met our new group for the second part of our tour. We were doing a 42 day tour but it was broken in half. So the first half was Cape Town to Vic Falls and the second was Vic Falls to Nairobi. 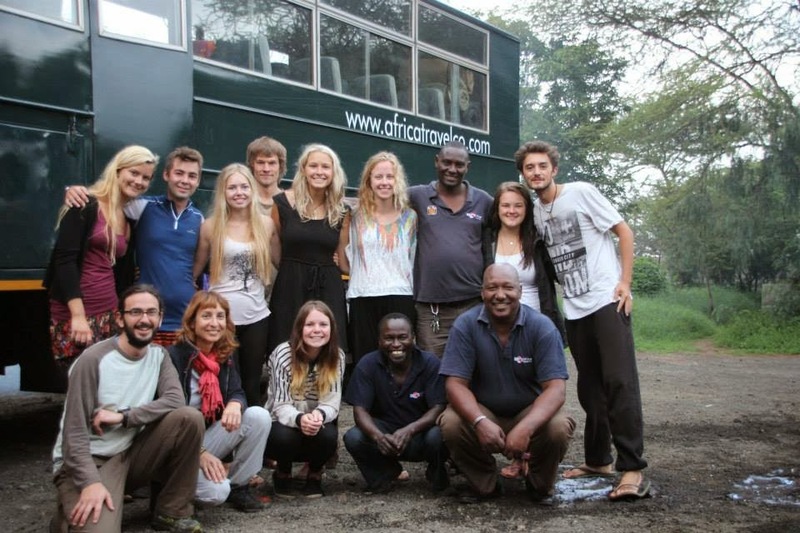 It was so sad saying goodbye to Jabulani and the new group were certainly very different from the first. We had a huge mix in this group. Canadian, English, German, Swedish, Spanish, Aussie and us Kiwi’s! This part of the trip was a lot harder. While we made some good friends on this tour we didn’t all click as a whole as we had with Jabulani. We also spent most of the week days driving. And I mean long drives. 14 hour days. 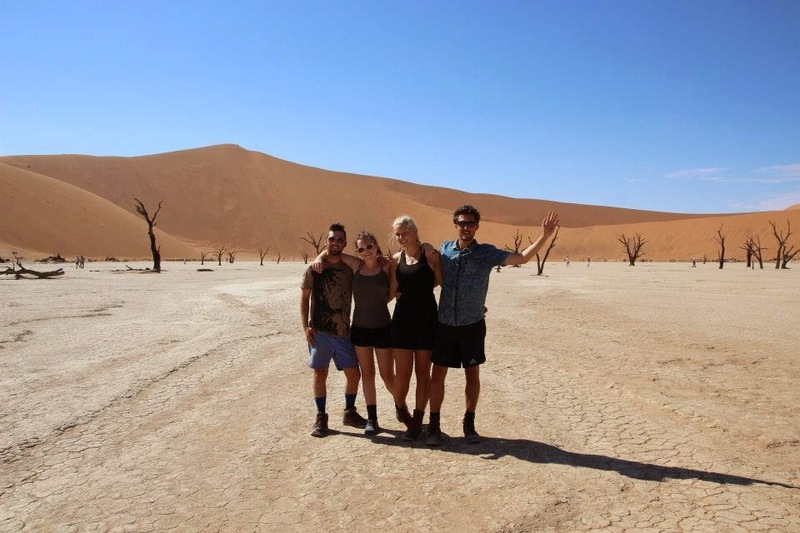 We were getting up at 3.30am for breakfast at 4am and would drive non-stop until 6pm where we’d set up camp, have dinner, go to bed and do it all again the next day. It really wasn’t that enjoyable to be honest. However there were some stand out points. 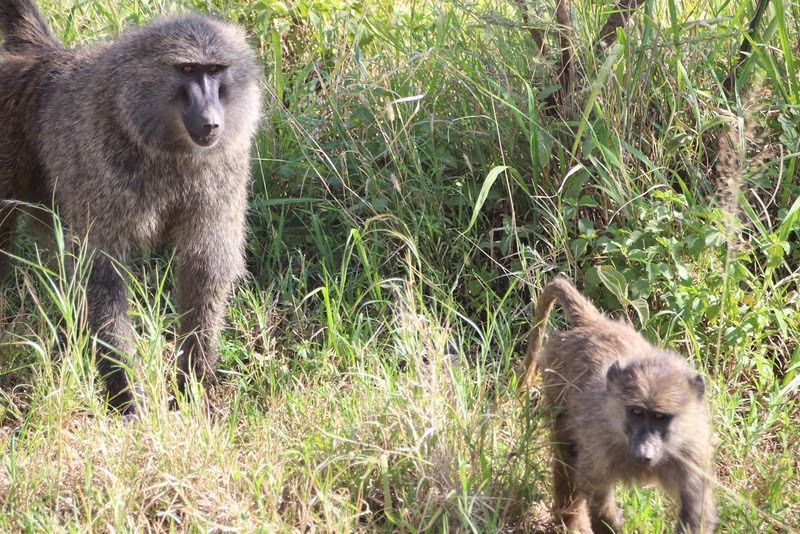 We went back to Chobe and did the overnighter again which was good as Jesse got a chance to do it the second time! 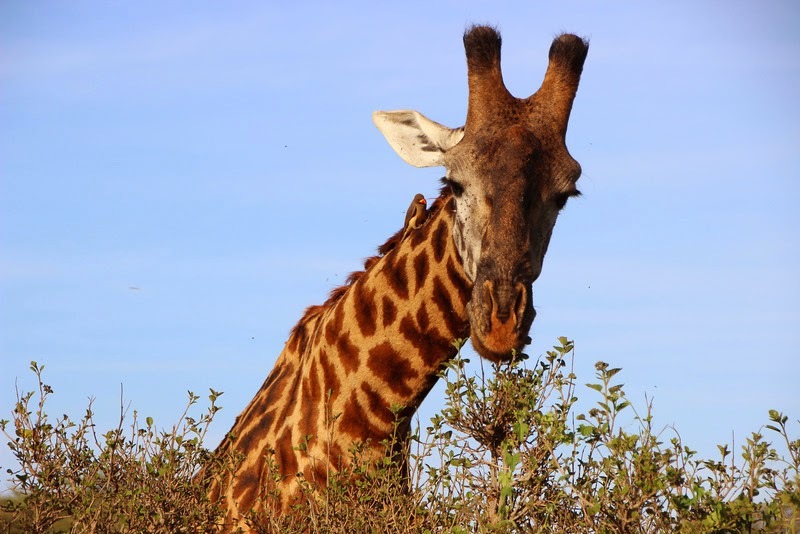 I had a nightmare that night that I was getting attacked in my tent by the animals that wandered free through the camp. I’m a bit of a sleep talker and on this occasion I became a sleep screamer yelling “Oh my gosh please, get off me, help me” etc etc. I woke most of the camp. Except for the guides who had said ‘call out if you get in trouble’. No one came to check on me! But I got a lot of flack for it in the morning! 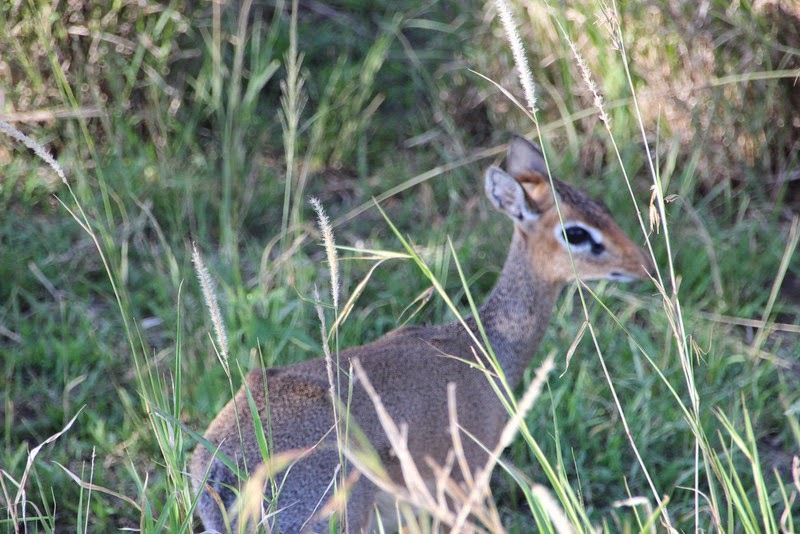 In Zambia we went to the South Luangwa National Park where we saw more hippos, impalas, another leopard – this one was super cool and walked in front of the safari truck for ages! We also had a hippo walk through our camp and spent a long night playing pool. 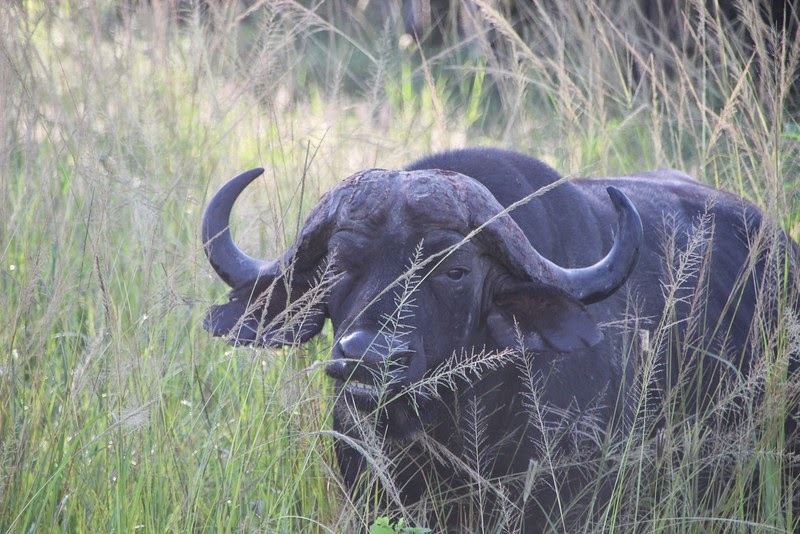 We saw plenty of Cape Buffalo too. Funny looking animals. They almost look like they have pigtails don't you think? 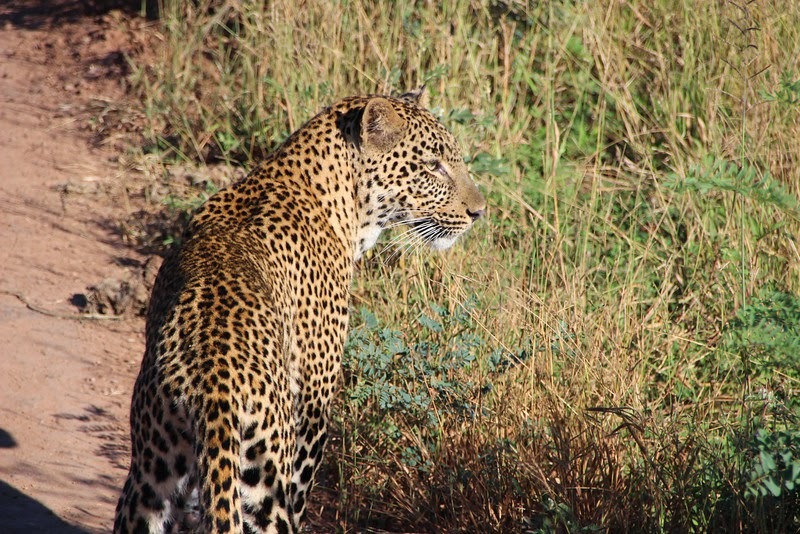 This is the amazing and beautiful leopard that walked with us for a while. Isn't her coat beautiful? She didn't seem to be on the hunt but was just having a wander around, didn't seem phased by the fact we were right there. Stunning creature! 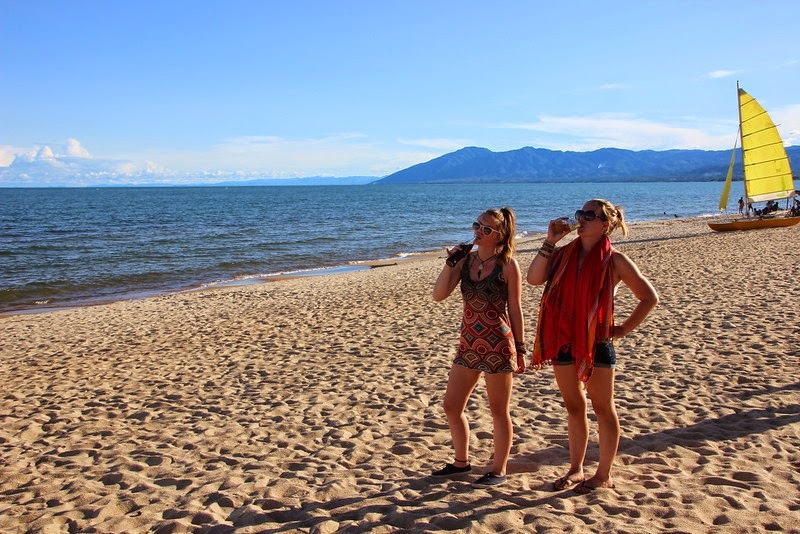 We spent several nights at Malawi beaches where we sunbathed, had prediction readings from a witch doctor (newsflash, they were pretty much all the same… right down to the things he was saying, so it was kind of silly but a cool experience.) We also had the option to do snorkling, diving and boat trips on the river. 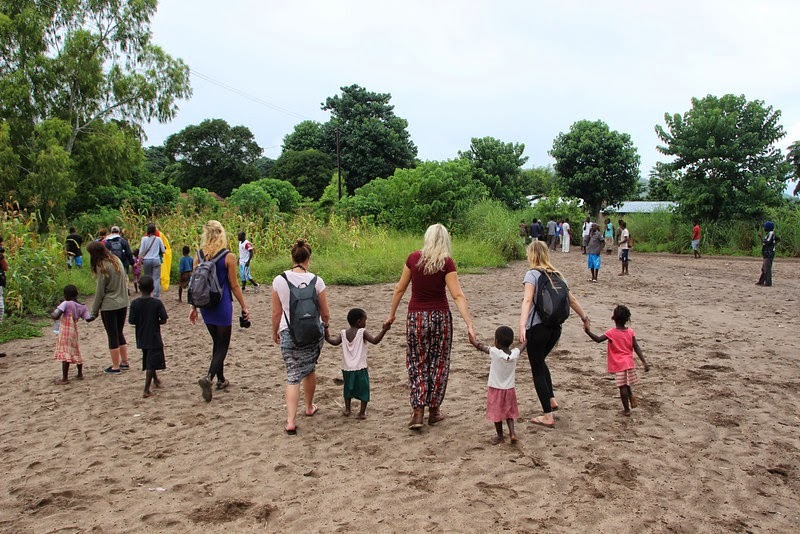 We all did a walking village tour through one of the villages in Malawi which was heart breaking. Some of those children are so unwell and so desperate for attention. They mostly live on cassava root as that is what their main export is. They spend all their days picking, drying and beating into powder the cassava. It's food but it means the children are severely malnourished. Their clothes are dirty, clean water is a luxury they don't have and any drinking water they want needs to be pumped into buckets and carried home. One 5 year old girl… she looked like she was about 2, that’s how small she was. She fell asleep in my arms, desperate for attention yet too exhausted to keep her eyes open. She was just so sweet. I wish there was some way I could've helped make her life just a little bit better. Another little girl clung to me, even as the old boys tried to pull her away (I think they were scared the white people were going to take their kids away….). This girl was so unwell. She had an awful cough and was clearly miserable. I desperately wanted to help her…. But how could I? I asked a local doctor about her cough, he said her mother would have to bring her in and she’d have to take pills. Which she probably wouldn’t take. It was horrible and so sad. The beaches in Malawi, however, were beautiful, although it did get a bit much all the local young boys trying to sell you weed or force you to buy their handmade goods. Zanzibar was BEAUTIFUL. What an island! 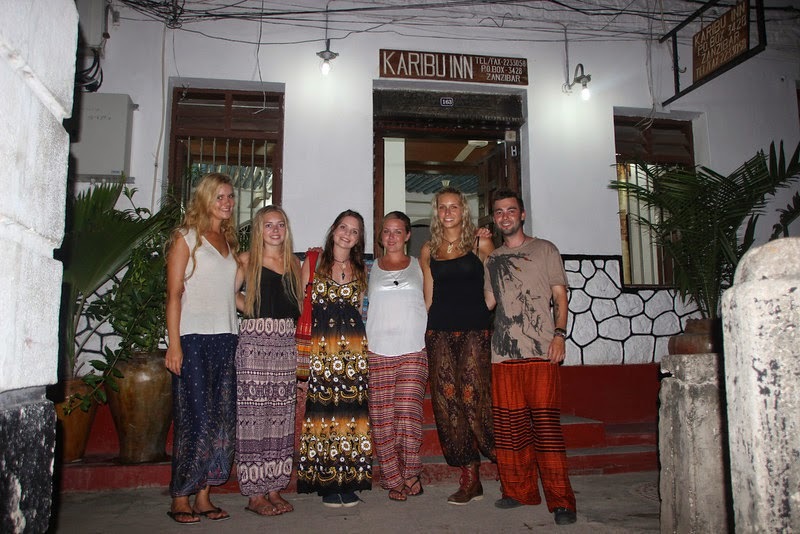 We all had to cover up, particularly during our time in Stone Town so hit up the local markets to get some awesome baggy trousers to cover our skin (It's a Muslim country). It's lovely though, so many tiny walkways, cobblestone streets, little market shops, lots of restaurants, and very cool cafes. A great vibe! Plus you can see Freddie Mercury's House! He was born here - crazy right! 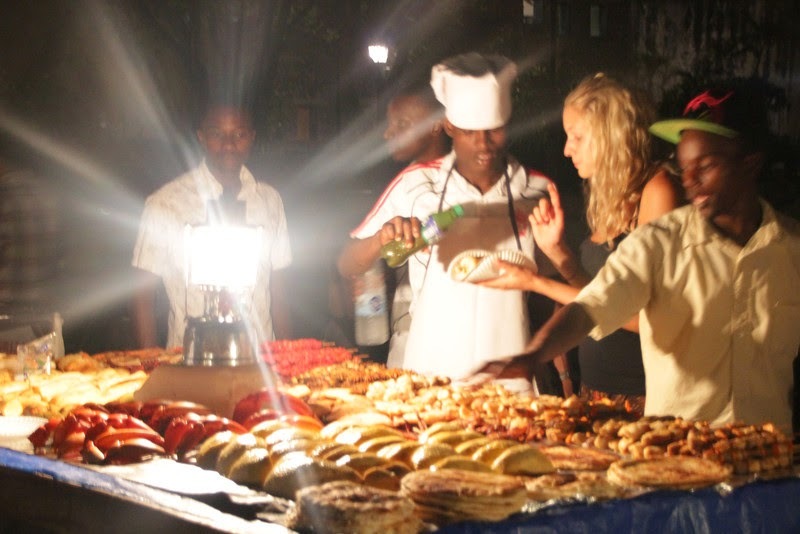 There's a really awesome food market in Stone Town which we all checked out. Careful though as many of the fish and meat that they don't sell they just roll over to the next day. It's REALLY easy to get sick in Zanzibar. They have lots of different foods though - seafood, meats, BBQ corn, breads, fresh juices, fruits, fries... almost everything you could image! A very cool vibe down there too. Be wary of locals trying to sell you alcohol. It's illegal! 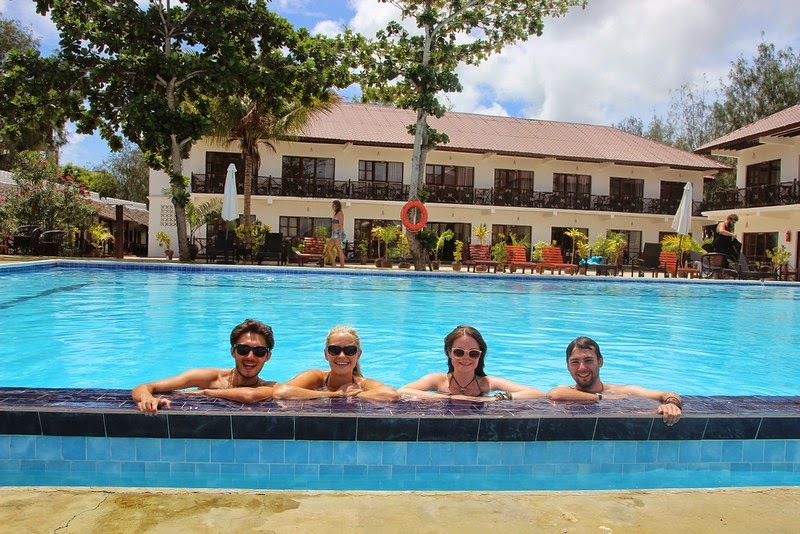 After a night in Stone Town we headed up north to a place called Nungwai. We stayed in a little resort and wow, it was incredible. We were in paradise. The beach was stunning, the resort was like a little village with salon, shops, restaurants and bars. The pool was huge and warm… It was honestly perfect. There were a number of beaches we could use which all had volleyball nets and plenty of room for sunbathing! The only problem was there were tiny invisible jellyfish in the ocean that stung you when you swum (we swum anyway, they stopped stinging within an hour) and almost all of us got stomach bugs either from the ice they put in the drinks or from the food itself – I suspect a mixture of both. We were all sick for the next week at least! 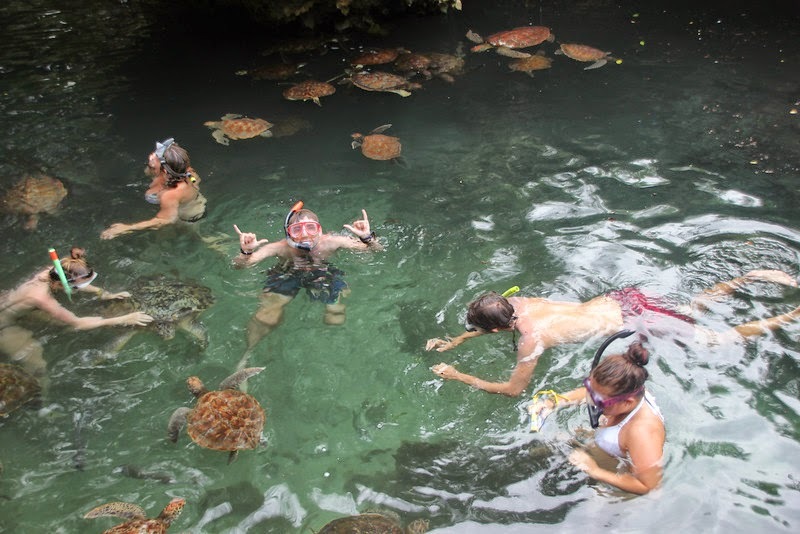 One cool thing we did in Zanzibar was swim with the turtles which was very cool although one of them did bite me!! It hurt a lot! A lot of the others swam with dolphins as well which they said was amazing. I swam with dolphins in New Zealand a few years ago so opted not to in an attempt try and save some money! 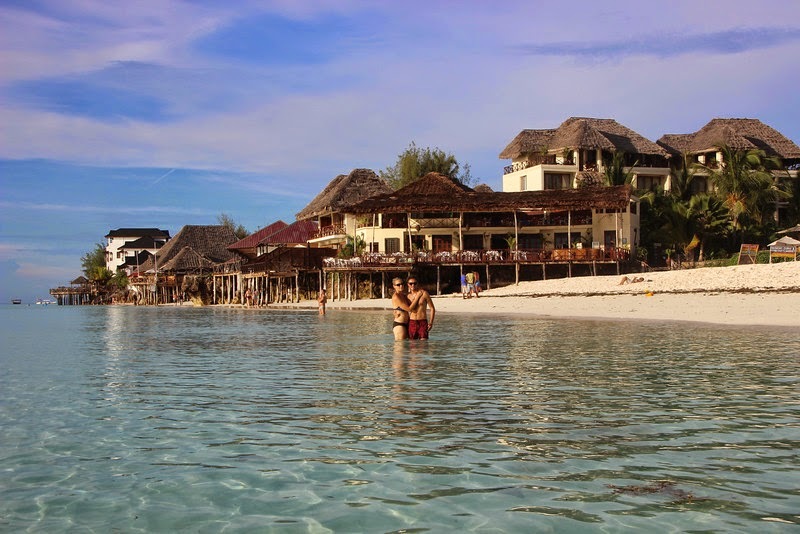 Zanzibar was very cool though! 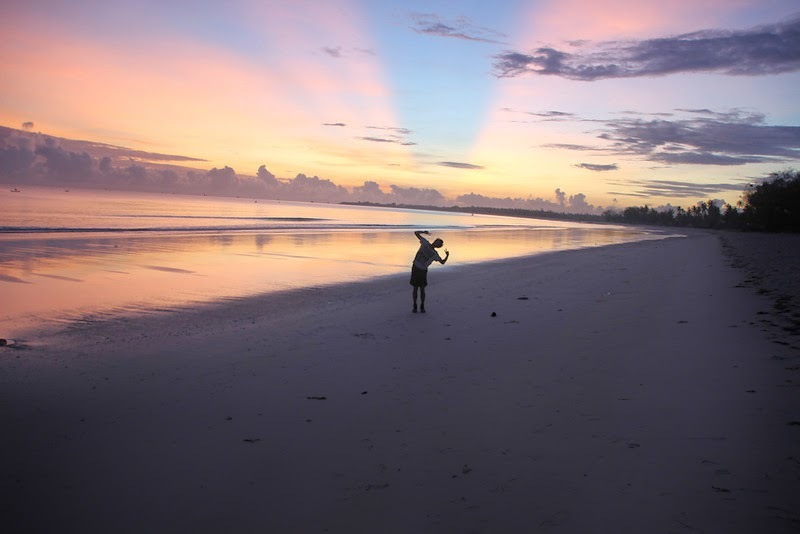 After Zanzibar we stayed a night on the beach by Dar Es Salaam. My gosh that city is SO busy. So much litter, so much craziness and the traffic.... wow. It took us three hours to get from the outskirts to the centre of the city. It was madness! But the beach was beautiful and the water warm and the sunrises.... oh my goodness. 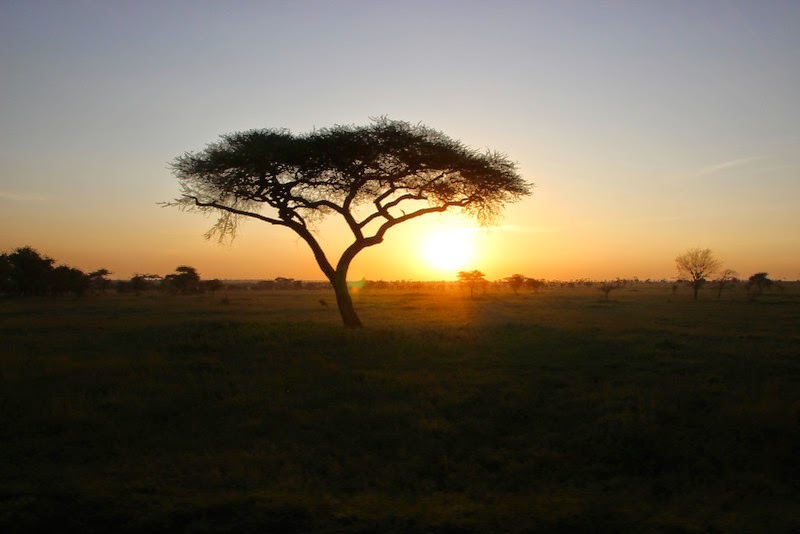 I've never seen so many sunrises in my life but the ones in Africa.... they're unrivaled. 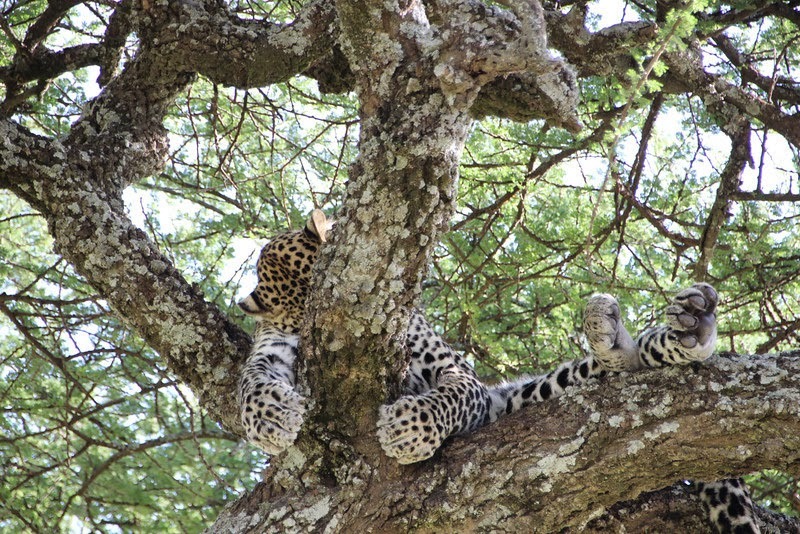 Finally we headed up to Arusha – the gateway to the Serengeti. The trip into the Serengeti was an extra $500 USD so we had been umming and ahhing for the whole trip about whether or not to do it. So many people said we should just do everything to ensure we didn’t regret it. Everyone said it was amazing and the tour leaders said it was the highlight. Eventually we gave in. I’m so glad we did. I wouldn’t have wanted to stay behind at the campsite! 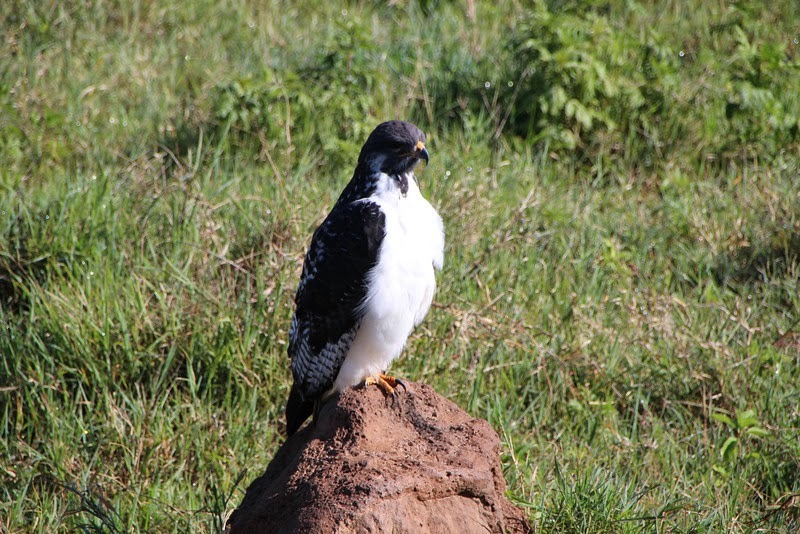 It was the highlight of my entire Africa trip. It was beyond incredible! We started out by getting some supplies in Arusha and visiting the store that sells Tanzanite. For those that don’t know Tanzanite is a beautiful blue/purple stone that is 1000 times rarer than diamonds and is mined in Arusha. Because of that it’s much cheaper at the source. Prices of Tanzanite are rocketing worldwide so we figured it was too good of an opportunity to miss. Sam brought Jess a Tanzanite engagement ring and proposed when they were in Thailand a few weeks later which was exciting! After the Tanzanite store we headed back to camp and checked out the snake park. 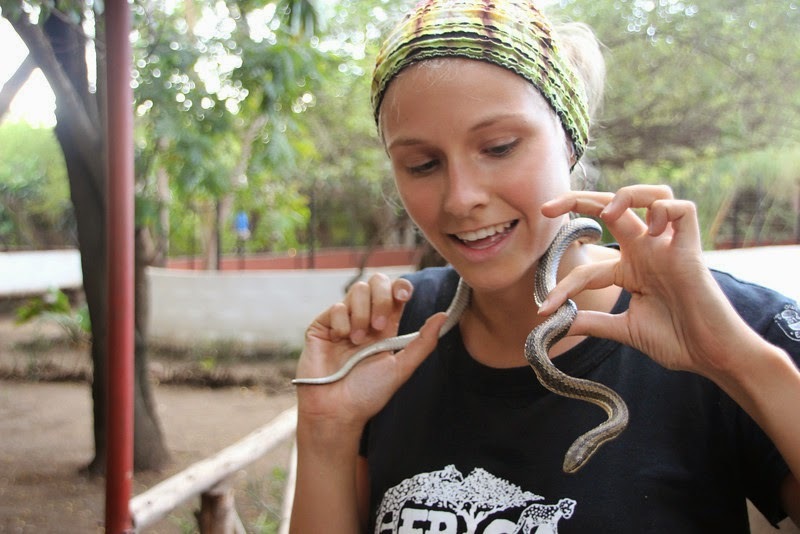 I held a snake. No kidding. It was small and terrifying but I held it. And then I had a baby croc. I felt bad about that though as he seemed really distressed whereas the snakes were pretty chilled about it. 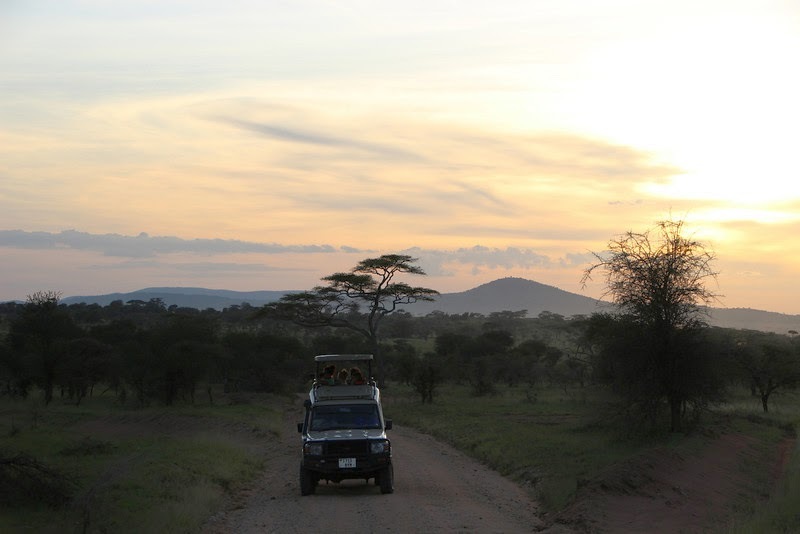 Then we packed up our gear and were picked up by the crew from Bee Eater Safari’s who drove us out to the starting point. We had the evening to relax and then was served an incredible dinner by the Bee Eater cooks. I have awful food allergies and hadn’t been fed particularly well on the second half of the trip (the chef on the second half really didn’t get it. He would only manage to process one thing eg. Oh she’s allergic to gluten. Good. And then serve me onions which I’m highly allergic to. Or he’d serve me beef despite me not eating red meat. Or he’d serve the vegetarian girl a plate of eggplant. Or he’d just give us rice. It was pretty crap! 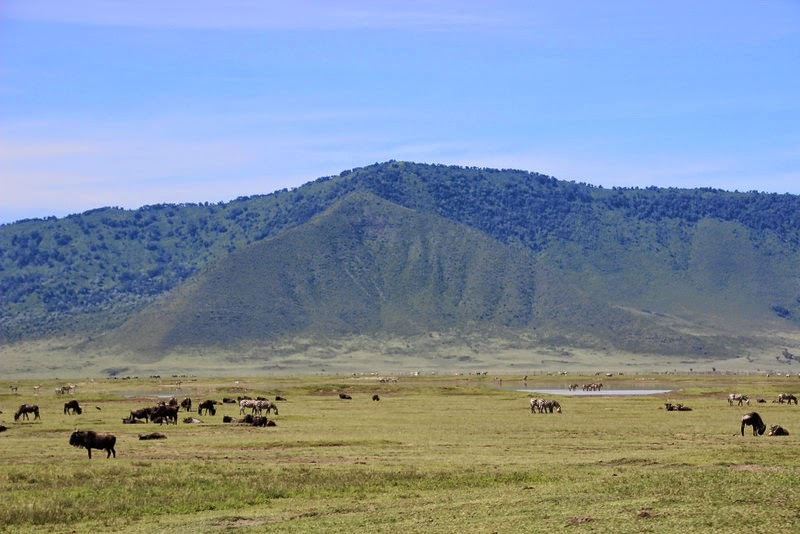 But in the Serengeti… oh my goodness! Heaven. The food was SO good. And there was so much of it! Honestly, huge kudos to the chef with Bee Eater because he was amazing. 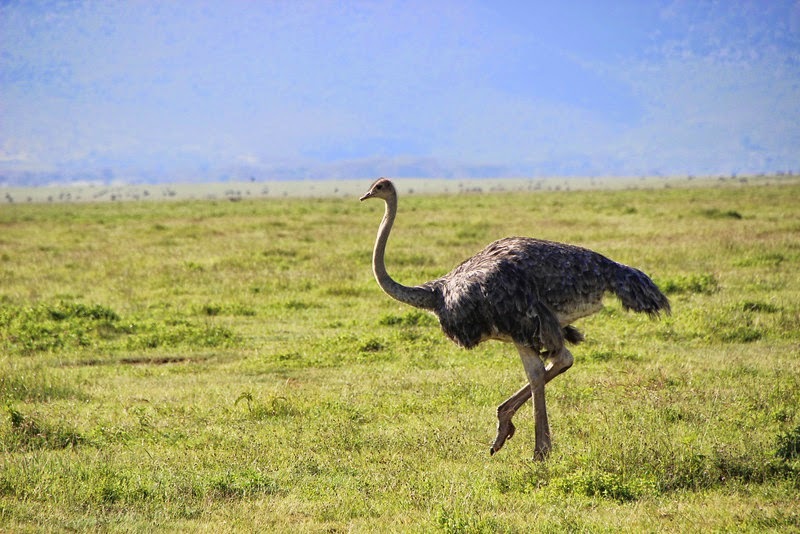 The next morning we headed out very early making it in good time to the Ngorongoro Crater. It’s stunning beautiful and absolutely packed full of animals. 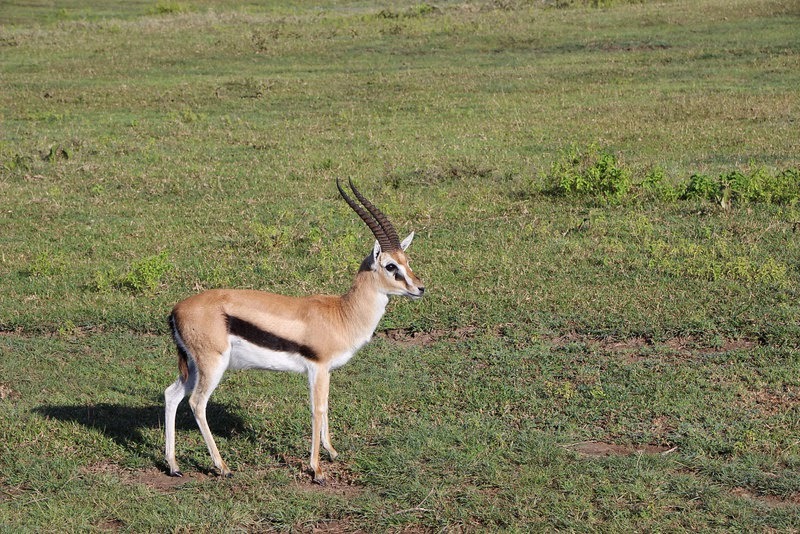 We saw so many wildebeest, gazelles, another black rhino, flamingos, cape buffalo, elephants and of course the lions. 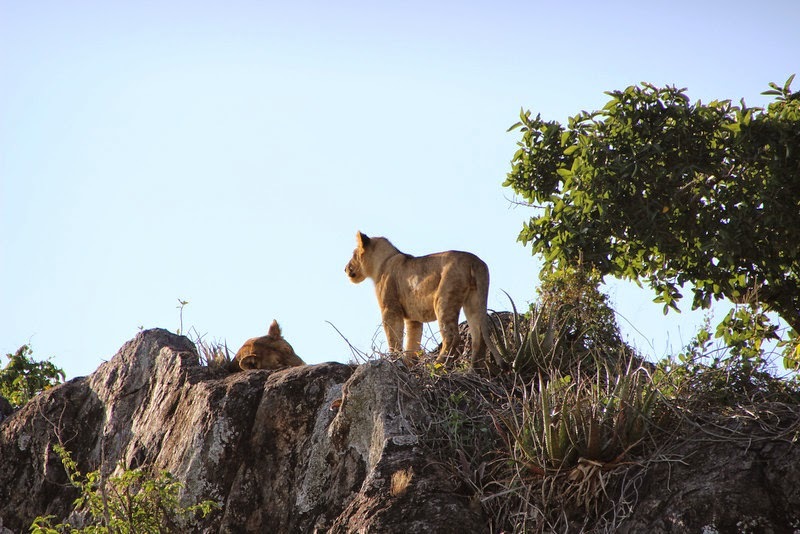 We hadn’t seen that many lions up until this point so we really wanted to see lions. Well we saw them. They were busy mating. It was quite amusing. 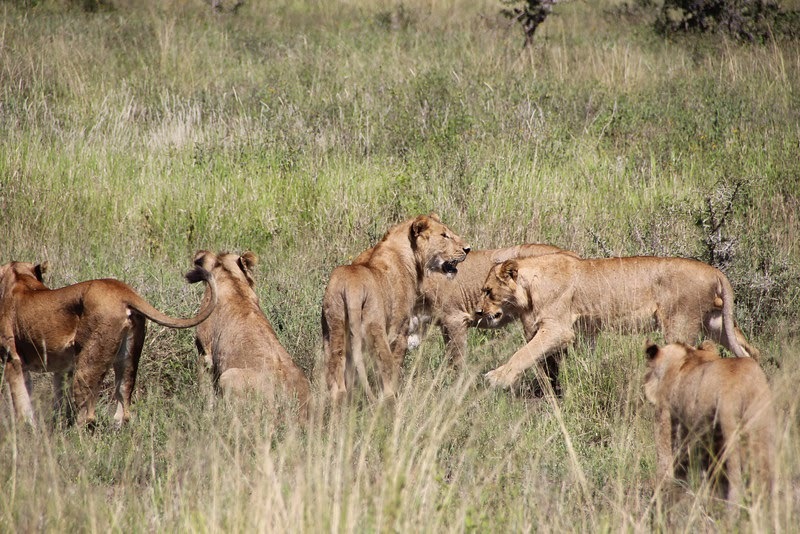 Then we saw a pack of female lions out on the prowl trying to take down wildebeest. 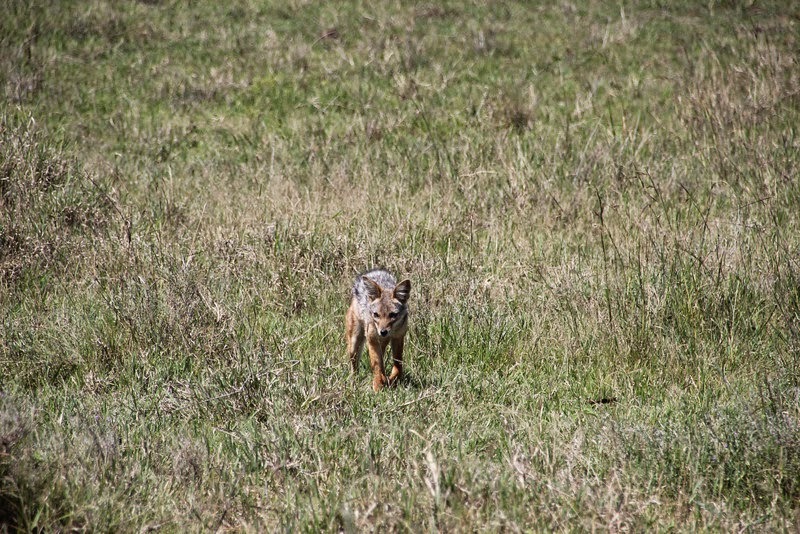 Then we saw hyenas and more zebras…oh man it was so incredible. We had lunch by a beautiful lake which was filled with hippos. We were eating outside but then hawks started swooping us trying to steal our food so we had to eat in the trucks! After lunch we headed to a Masaai Village which was really interesting and gave me ideas for my book! Their culture is very interesting and the way they live is very basic. Their huts are tiny and usually fit 5 or more people. They’re made out of cow and goat poop and grass plus flax. They retain their traditional dress and their orders of rank and we were welcomed with a jumping ceremony. We all had to jump while they sung. The boys jumped first, holding the sticks and the girls then had to wear necklaces and jump. Then we looked around the village and market, the guys showed us their homes and told us about their lives and then we visited the school where the kids sung for us and showed us how they could do the alphabet! Pretty cute! 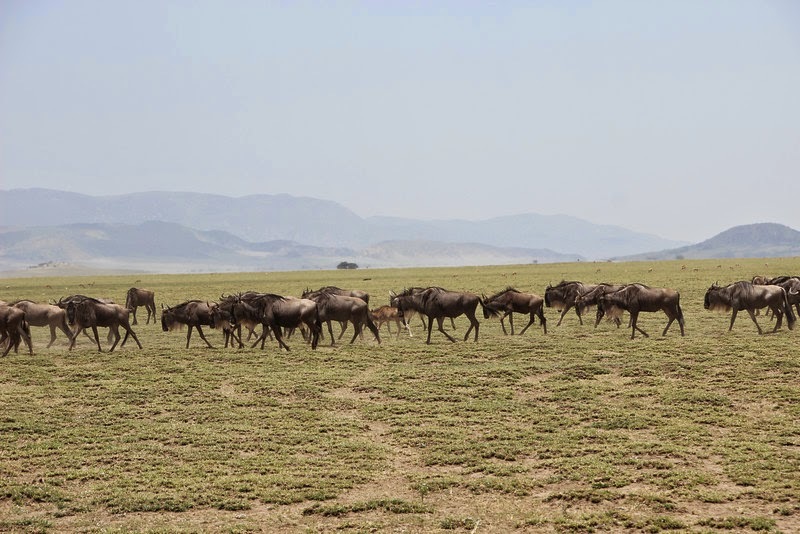 After that we headed to the Serengeti. I’m sure you’ve seen the Lion King? This is where it’s set. We even saw what should be Pride Rock, except it’s called Lion Rock and they all hang out there! So cool. Saw plenty of Wart Hogs running around too! 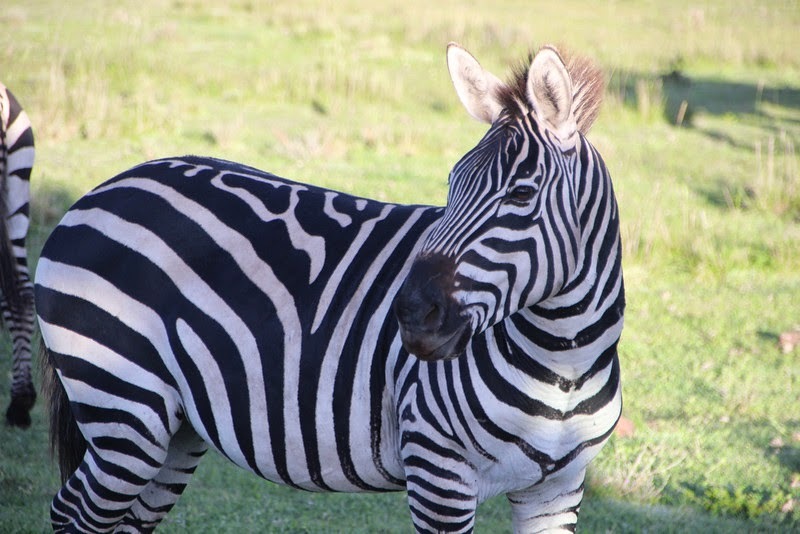 Lots more wildebeest (it was their migration season), and zebras, hippos, giraffes, antelopes, dik-diks (a type of antelope – SO CUTE! ), and lots of lazy sleeping lions. 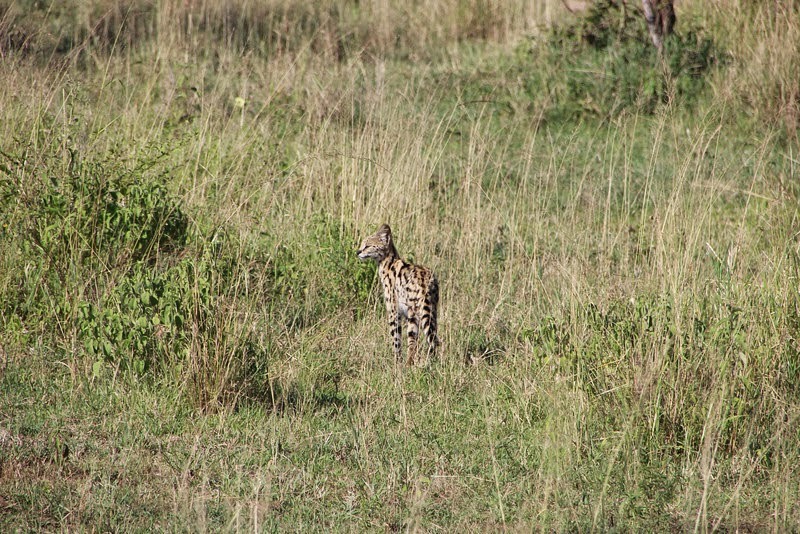 Even better, as we were heading to the camp for the night we saw a serval! 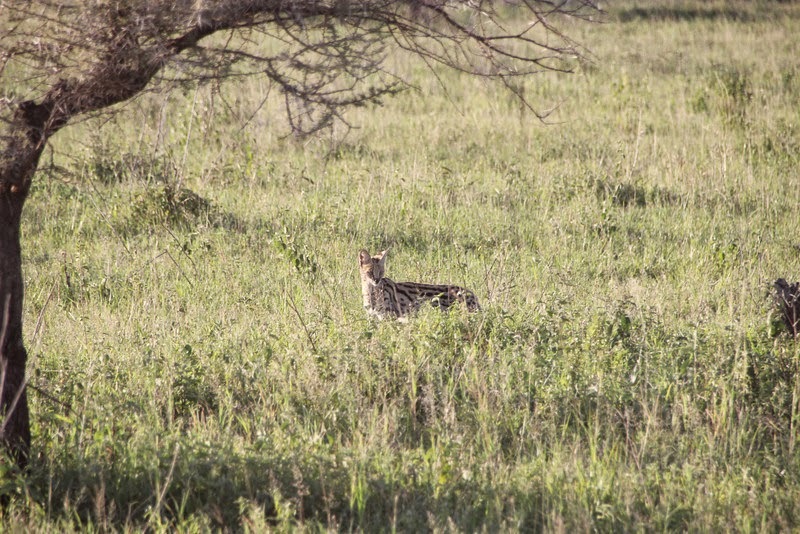 Most people don’t know about servals but Jesse LOVES them (they’re like really big house cats) so it was awesome to see one in the wild, although the baboons were trying to corner it and eat it! 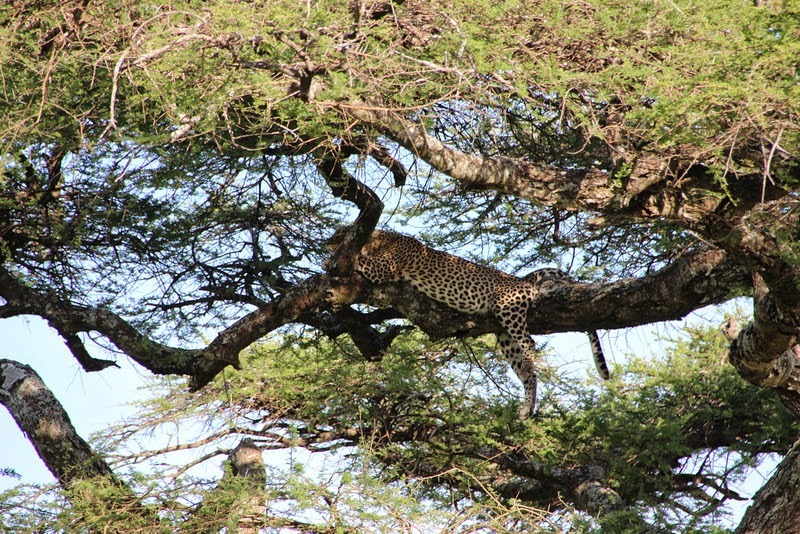 We also saw two leopards sleeping in the trees. One of them had a dead gazelle strung up which she’d obviously killed earlier that day. That night we had another delicious dinner and took some epic photos with the amazing stars that were on display. We had to grab something out of the truck at one point and Jesse and I were actually pretty scared…there were lions and hyenas roaming. 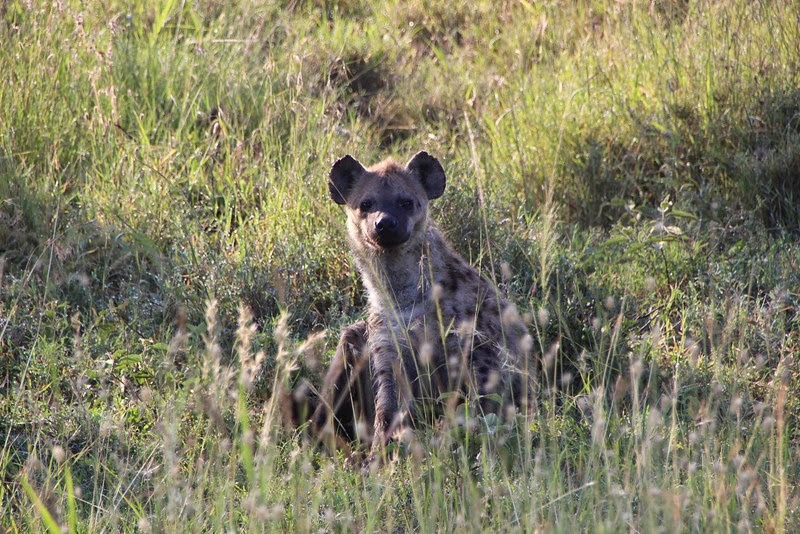 One of our group had spotted a hyena near the kitchen so it was a little scary! We went to bed early that night! (Actually since we were up before the sun almost every day and there was no internet or TV we were usually in bed by 10pm at the latest! 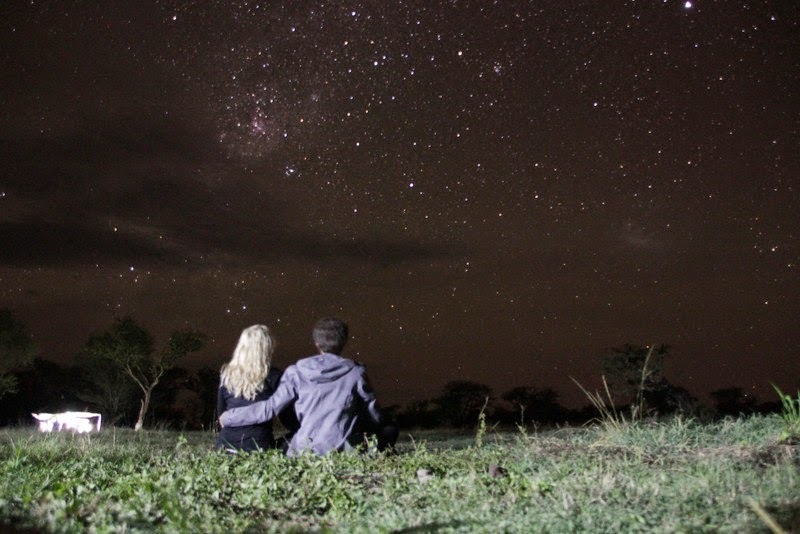 That night the hyenas walked around our tents laughing and calling to each other. They went right through the rubbish we’d left in the bins and scattered the remains all over the ground. Scavengers! I’m glad I didn’t need to go to the bathroom during the night! 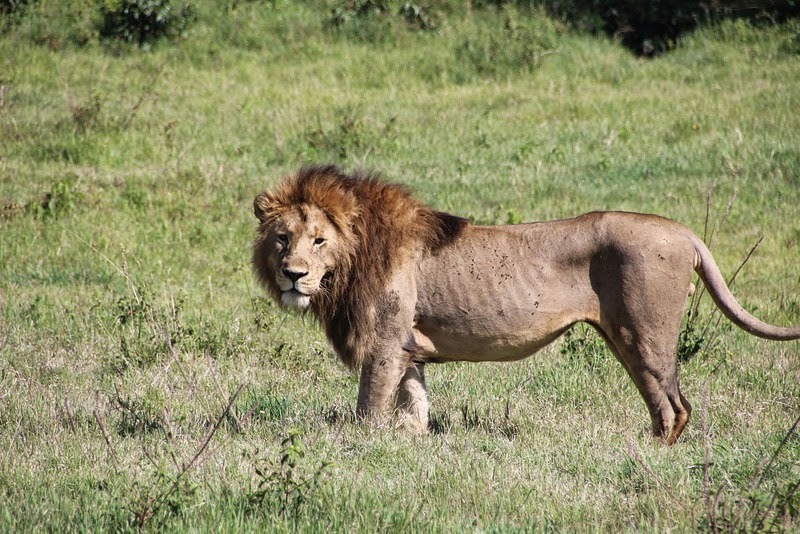 We were driving along a dirt path and in the middle of the road lay a lone young male lion. He stood up as we approached and we turned off our engine. 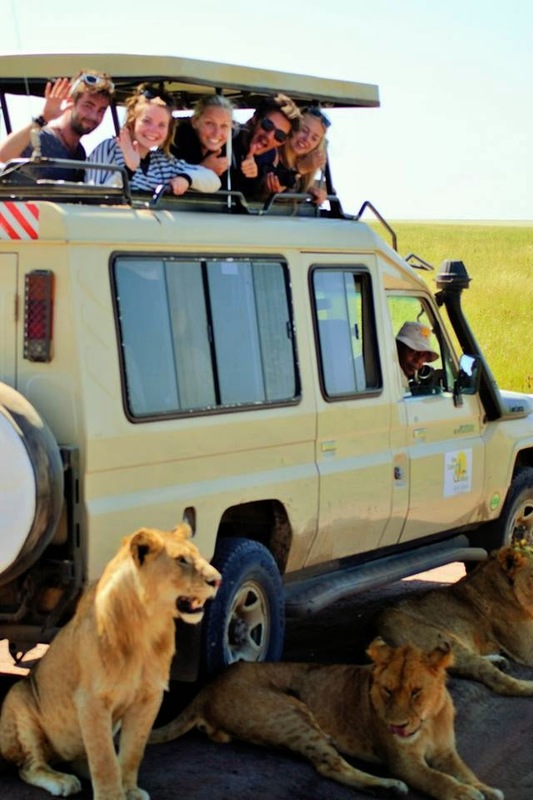 Over the next five minutes, 12 young lions, mostly female surrounded our truck. Some lay in the shadow of our truck trying to get a break from the sun, others just wandered around. It was AMAZING. 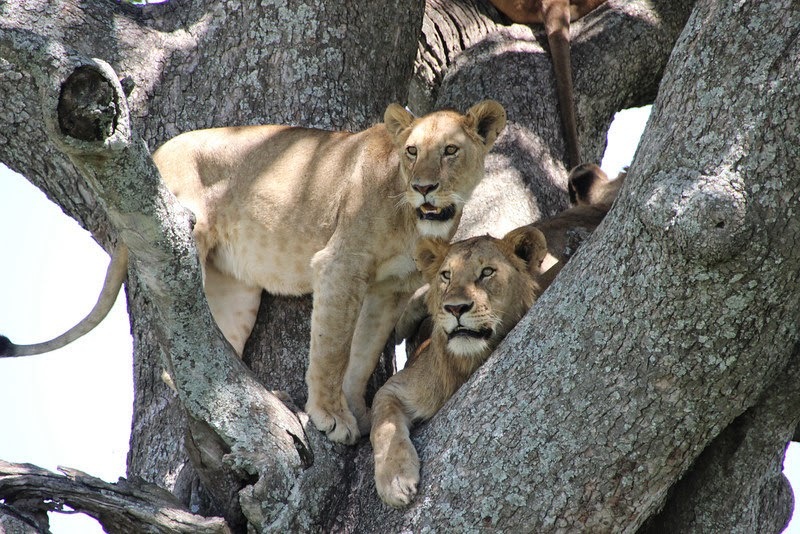 After about half an hour the lions wandered off and climbed a tree, keeping a very close eye on a nearby elephant who was wandering alone. We watched those lions for about an hour and I reckon we would’ve watched way longer if we hadn’t had to get back to camp! It was an incredible experience! 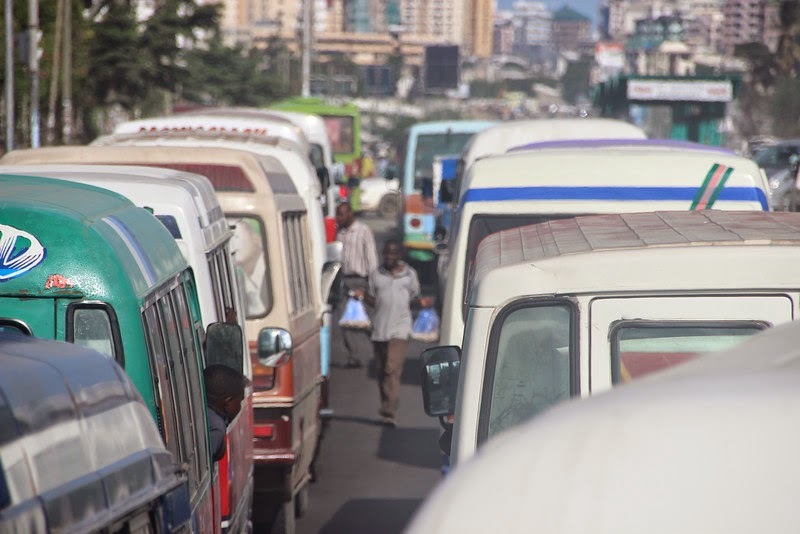 The next day we headed through the Kenya border and up to Nairobi where our tour ended. 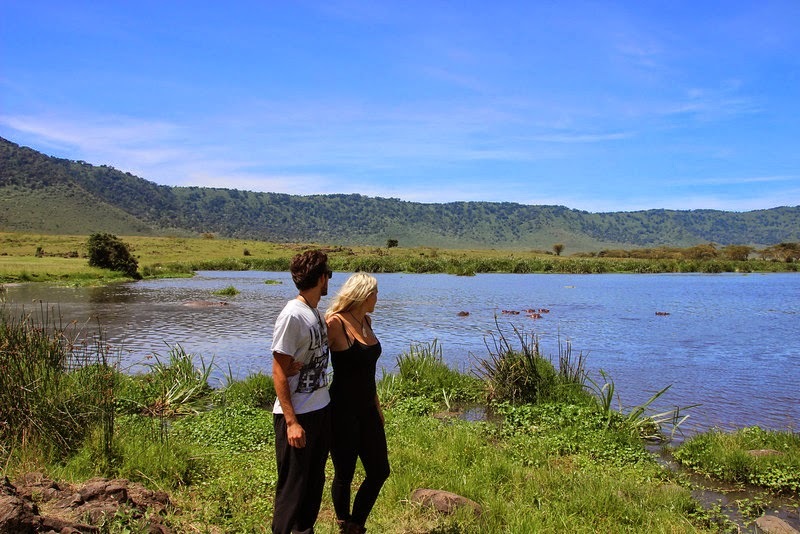 That evening the four kiwis jumped in a taxi and headed out to the David Sheldrick Wildlife Trust. My mum is a HUGE elephant lover. Her house, the house Jess and I grew up in is FILLED with all things elephants. So for Christmas we adopted her an elephant from DSWT. The work these guys do is really incredible. 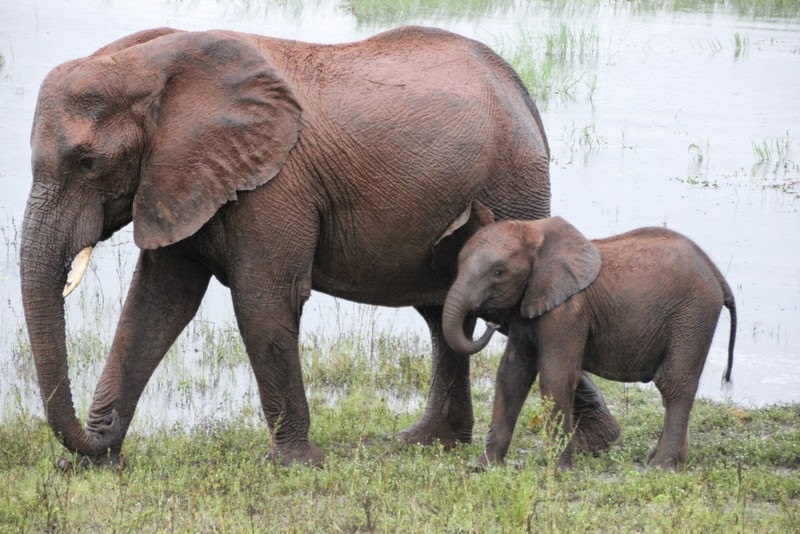 They rescue baby elephants (or any other animal) who has been orphaned or injured and help them recover slowly allowing them time out in the nearby national park and interaction with other elephants. 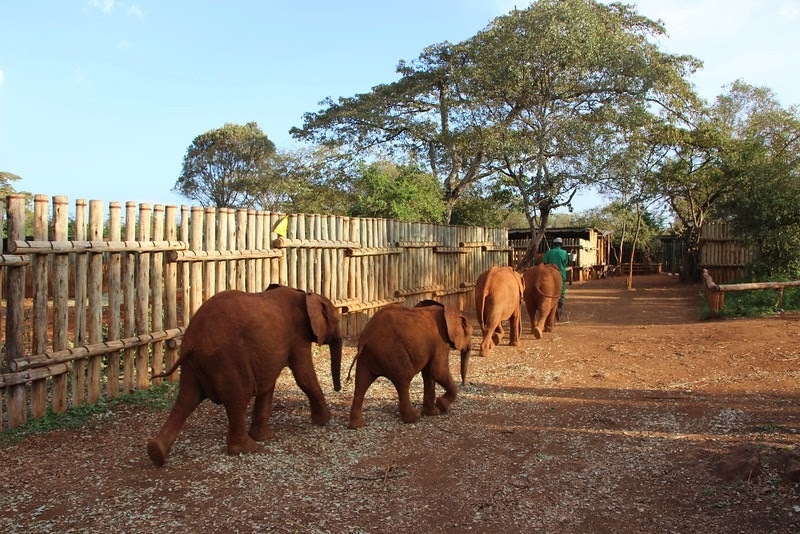 As the orphans grow they learn how to be a wild elephant and are eventually released back into the wild. 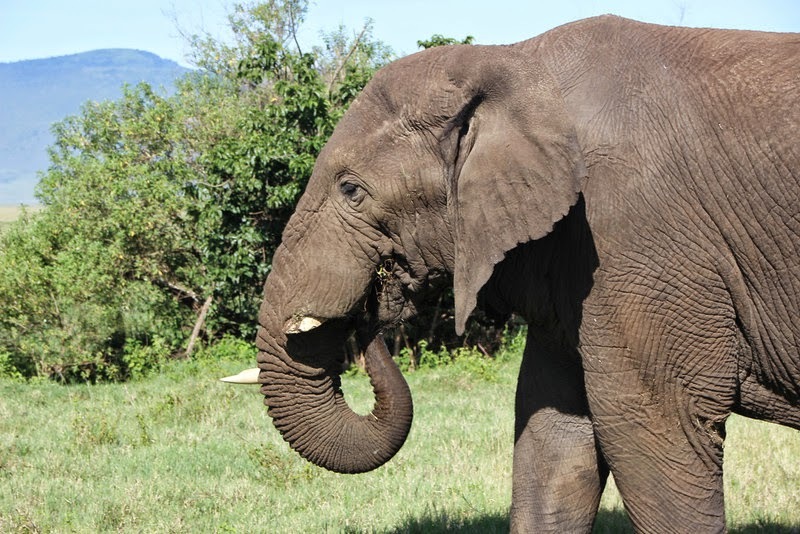 In order to do the work they do it costs them 900 USD per month per elephant. And to adopt one of these beautiful babies is only $50 USD per year. We gave mum a booklet of all the baby elephants they had. 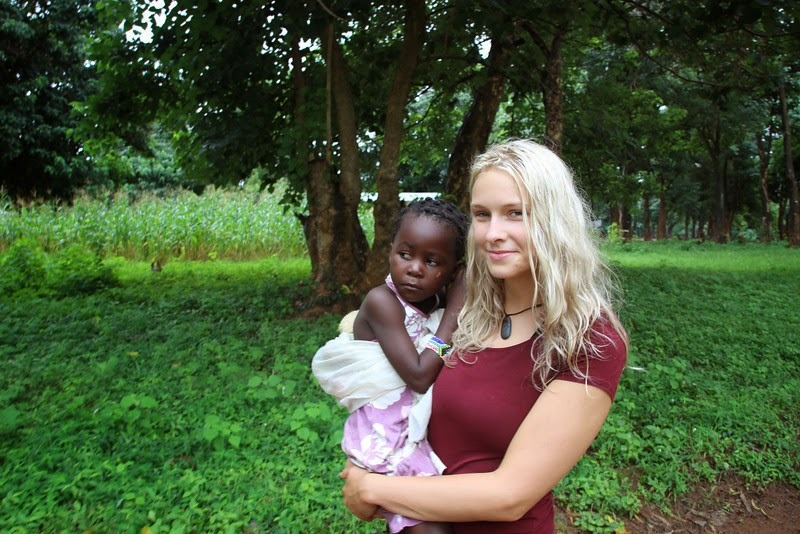 She wanted a little girl elephant who was still very young and chose Kamok. 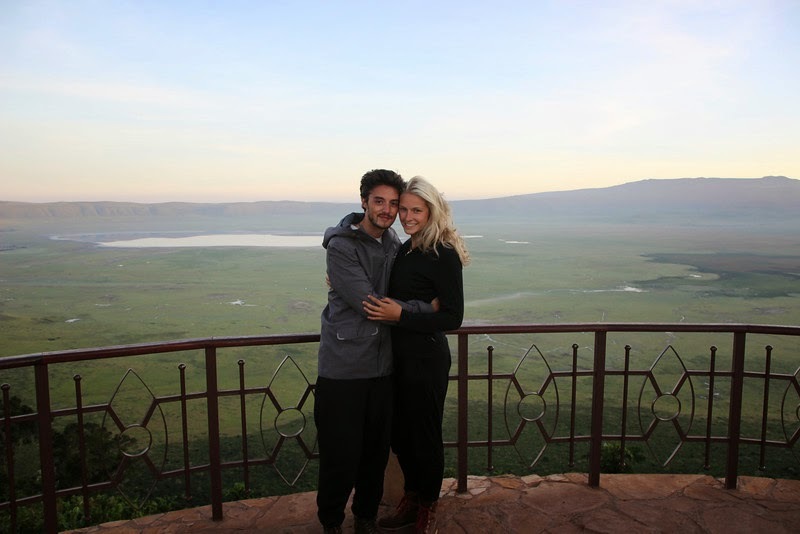 Jess and I made it our mission to go and see Kamok when we were in Kenya and we were worried it wouldn’t happen. But it did. under her blanket when we arrived but her keeper woke her up to say hi to us. 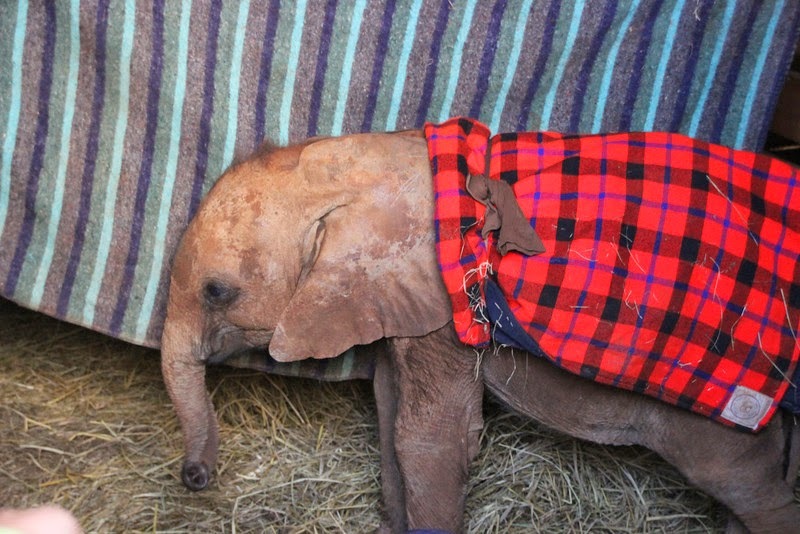 She played with a ball and a blanket for a while and came up to us, wrapping her trunk around our arms. It was amazing. The keeper literally lives in her pen, sleeping on a bunk bed, being there all the time for Kamok. 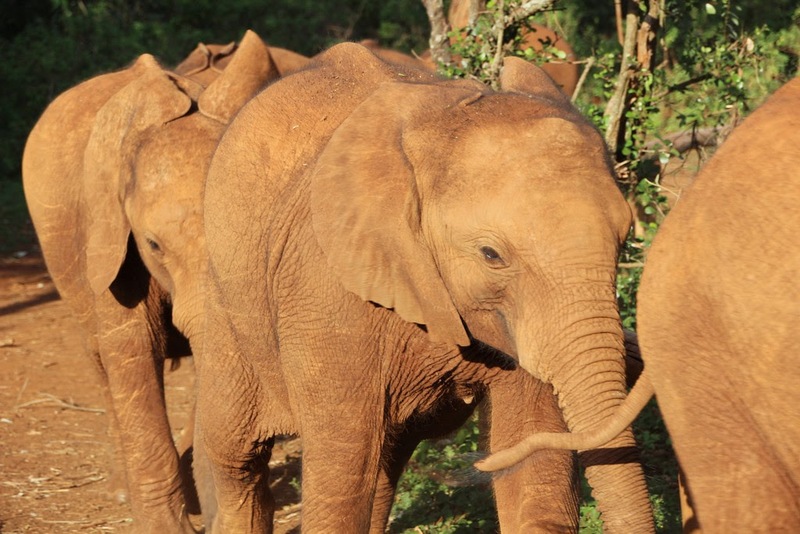 Kamok herself has become a little matriarch amongst the baby elephants. It’s very cute. I highly recommend checking out the work they do. It was incredible to see! The next day Sam and Jesse swapped photos and then in the early afternoon we said goodbye! I’m not sure when I’ll see my sister again but it was really nice to be able to spend that time traveling with her! Jesse and I flew off to Egypt and Sam and Jess flew off to Thailand.